Ok, first scoop reviews gonna be a bit concise since my eyeballs are already half closed. 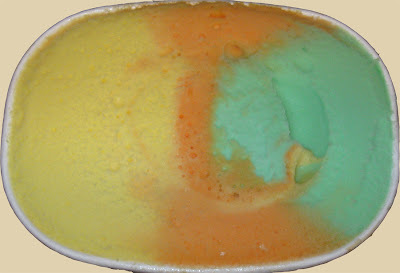 Well, I guess the container should be the tip off that this is a swirled sherbet and not a divided sherbet. I'll admit it looked a little funny when I first opened it, but I attempted to dig in anyway. It's not so much that it's bad, it's that it's not that good. Thankfully it's not one of those salty sherbets. The flavors are just kinda blah. Sure, they are there, but they're weak and not particularly good. I ate it but I became less enthused with every bite. 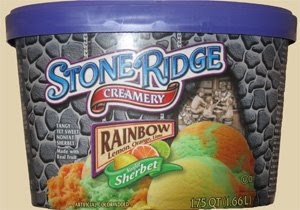 Maybe I just wasn't in the mood for sherbet like I thought I was. Mmmm, that looks so good. Great website by the way! I'm going to tell all my friends! Ice cream is my favorite dessert. I just had Ben N Jerry for the first time the other day. I brought the half-pint of Fudge Brownie and Strawberry Cheesecake. It was delicious.